A damning depiction of rehabilitation, hierarchy and corruption. Despite being released over 30 years ago, I was pleasantly surprised to find that Scum has lost none of its punch. ‘Scum’ is an unforgiving portrait of the British borstal system – 1 hour and 30 minutes of both physical and psychological abuse. The film examines the hierarchy of the borstal, looking at the behaviour and roles of both the officers and the inmates, questioning who’s worse. This hierarchy is ruptured when Carlin (Ray Winstone) enters the borstal. Carlin claims to be looking for ‘no trouble’, but really he is equally or even more pugnacious and skullduggerous than the rest. Much like ‘Cool Hand Luke’ and ‘One Flew Over The Cuckoo’s Nest’, ‘Scum’ explores the infuriating frustration of injustice in ‘correctional’ institutions. Personally, I find few things worse than the abuse of power, whether it’s within an institution, a family or any other context. I’m sure many would agree, subsequently making ‘Scum’ an engrossing and unpleasant watch for all. Asides from Carlin, the most significant character is Archer (Mick Ford), an intelligent, disaffected vegan who is a habitual troublemaker. Archer serves as an interesting plot device; he offers intelligent, biting monologues on the flaws of the institution, most notably to an officer’s face, who retaliates by reducing their civil conversation into another officious, hostile procedure. It’s Carlin’s arrival, growth and ultimately tenure as ‘The Daddy’ that serves as the central narrative of the film, but thematically the film acts as a condemnation of the borstal system and its corrupt, vindictive employees. 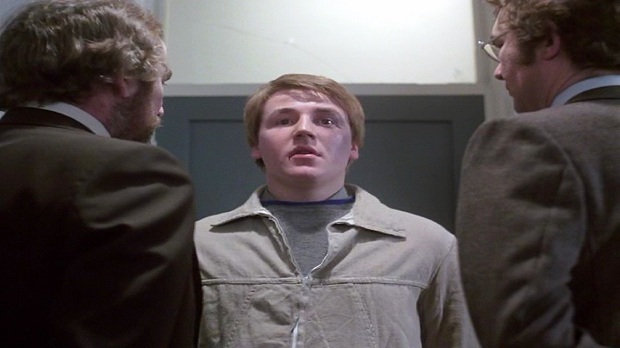 One may wonder if the film is hyperbolic, but the borstal system was abolished by government in 1982, replacing it instead with ‘Youth Custody Centres’. This corroborates Scum’s credibility.